Summary: 748 Biposto fitted with 94mm bore 853cc big bore kit, modified combustion chambers, set squish and reset cam timing. The second 853 kit install I’ve been involved with and the first on a base model 748. This one was done with using some s/h cylinders and pistons the owner had bought out of the USA. The pistons were the “steel rod” pistons and suited for both Strada and SP models with quite deep valve reliefs and a little flat, round dome in the middle to offset the deep reliefs. They’d come out of an engine that was running RS cams, and one that had come apart due to some rather bent exhaust valves on one cylinder judging by the piston hitting valves marks in the valve reliefs of one piston. No idea what the compression was, I didn’t check it. As this was an early bike with the thick 1.3mm fibre style head gasket, the base gasket thickness had to be increased to suit the later 0.5mm steel shim head gasket. I ended up with 2 of the early 0.4mm base gaskets (78610471A) on each cylinder  giving a squish clearance of 0.95  1.00mm. If it was my own engine I’d probably have run one 0.40 and one 0.30 (78610391A) for a bit more squish. I plugged the oil gallery to the vertical cylinder base gasket face with a long 4mm grub screw threaded in and gooped. The only mod done to the heads was Chris Steadman’s recommendation to take out the ridge separating the inlet and exhaust ports  see the photos below. Similar to what was done with the 749  924 conversion several years ago. No other combustion chamber or port work was done. The valve clearances were adjusted and everything refitted. The cam timing was checked and reset using offset keys. It was 120/111 on the horizontal and 125/105 on the vertical. I reset it to 111/108 - I had intended to use 112/108, but with the offset keys ended up at 111 on the inlets. No big deal. Exhaust was std 45mm headers and some slip ons. The owner told me they were Skorpian (early Akrapovic), but I think they’re possibly Silmotor as the Skorpians had a very distinctive oversized outlet outer piece and they weren’t Termi or Arrow. I fitted one of Doug Lofgren’s 853 eproms (UM097DL) with some minor mods (environmental trims) for a starting point and went to the dyno to map it as required. Turns out the first run was a real doozy. Which I worked out to be a bad vertical cylinder spark plug lead  sort of obvious when the steel terminal stays on the plug. But it still put me in a very, very bad mood and a day behind on a project that was meant to be finished that day and then ridden home interstate which was a real bummer. So I ordered 2 new leads (one for the horizontal as well for paranoia’s sake) and waited until the next day. As it turns out, when the first lead arrived I remembered that the parts lists are wrong when it comes to 748/916/996 plug lead part numbers. The Desmoquattro 4V from 851 onwards use the same leads, but on the 916, etc, the fitment is reversed  the lead with right angle coil fitting is on the vertical and the lead with straight coil fitting is on the horizontal. So the lead that should have had a right angle coil fitting (67110021A) had a straight coil fitting. Given I had already ordered the other part number (67110011A) I figured it’d be right when it arrived. But no, it too was the same lead as the 21A (straight coil fitting), this time with a 748R reference on the part label. The 21A still had the 851 reference, although it was more expensive (from memory). Wacky, but what I suspect happens when someone at the factory realises the mistake and fixes it without telling anyone else. But thankfully the straight coil fitting lead is longer than the right angle coil fitting lead so it works just fine as a vertical lead on a 748. Anyway, after the lead charade we got this  blue is before, red after. A very nice improvement. Not sure if the lowering of the rev limit will upset the owner or not, as it tends to at times. But the power peaks 1,000 rpm below the limiter and that makes me happy. The torque curves show that the general shape and tuning peaks haven’t really changed, they’ve just moved up. This is probably a function of the shorter cam duration than anything else  the 748SP tuning peaks moved around with just cam timing changes. Because I had become suspicious of the old FIM Hand Held Terminal’s maximum spark feature when used on the 1.6M ecu I made 3 eproms, each with 3 degrees less advance at WOT than the previous one. Just to see what difference taking some spark out would have. The next graphs show -3 (green), -6 (red) and -9 degrees (blue) from the original UM097DL map at WOT. The result quite surprised me, but I know that the mapping was changed so I have no explanation for the non changing output. Although it does point to the fact that the HHT is working just fine. More confusion on my behalf. The air/fuel curves shown are with the original UM097DL fuelling, which is pretty good. Like I did with the 853R bike, I made a spreadsheet comparing the before and after with a calculated improvement based on the capacity change, which is 14%. At that point I realised it had picked up quite a lot more than 14%. Below is that graph. Before is green, calculated 853 is blue and resultant 853 is red. 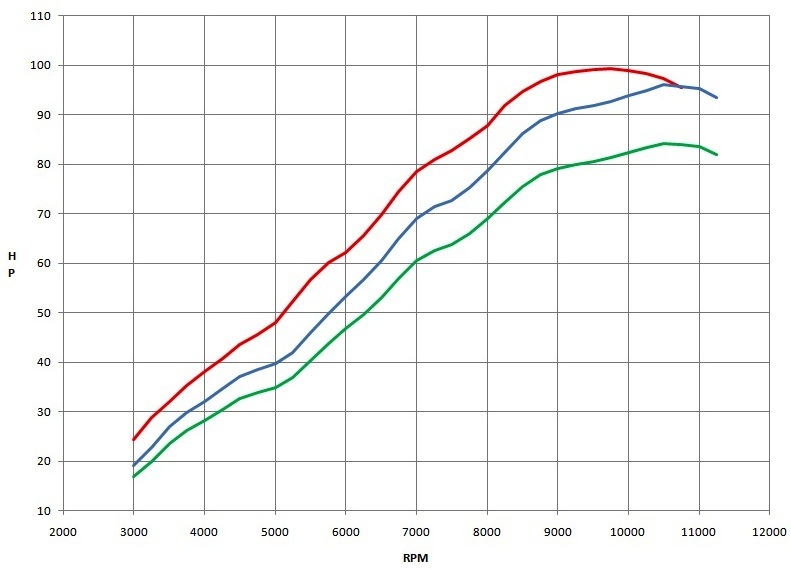 The improvement is 35% at 4,000 rpm, 38% at 5,000 rpm, 33% at 6,000 rpm, 29% at 7,000 rpm and 27% @ 8,000 rpm. It doesn’t drop to under 20% until 10,000 rpm. There’s a few other factors that help  the reset cam timing certainly does as it can add 15% or so on its own, plus there’s the chamber mods for better airflow and the tighter squish setting along with (I expect) more compression. Possibly the port sizes are more suited to this capacity too. Added up it all works to make a significant change. Whether or not it justifies the cost is a decision the owner has to make.